Many times I am asked if Pilates teachers have differences in other parts of the world. Culture is different, but Pilates equipment and exercises are the same. It is easier to look for differences than to seek common elements. The answer to the question for me is simple. We are members of a community and share the earth. Each person desires a home, family, and work that has value. Pilates is a path, through exercise, to seek the inner self and discover the truth that brings contentment. Every Pilates teacher has the opportunity and the possibility to help one other person find more peace. We do this one person at a time and one day at a time. This is happening all over the world. The choreographic differences are inconsequential. The passion for communication is universal. Pilates Conservatory graduated eleven students last October. These students work very hard to complete the course in four years: Yoko Kanda, Yukie Konno, Chiyoshi Tsujimoto, Kazuyo Moriya, Kazuyo Sugiyama, Fumie Baba, Junko Sakarai, Yukiyo Tamura, Rieko Oyama, Akiko Hattori and Jun Izumi. After graduation, they asked me if they could organize a tour. 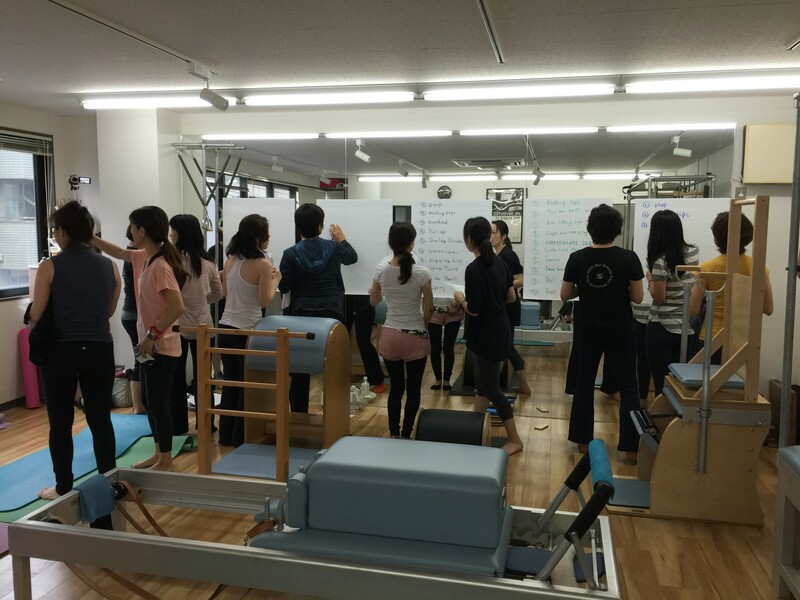 The tour started followed the Pilates Festival hosted by Pilates Alliance in Tokyo, Japan. Our schedule then began in Numazu for one day and then off to Nagoya for two days. The Pilates syllabus is vast but what teachers need is the experience of how to assess the body. A group of these graduates had traveled to Boulder and wanted more information on how to design a session for an individual client. This starts with an assessment which can be extensive paperwork or a quick evaluation of how the client presents and review of the past session notes. Class design must include client expectations and intelligent selection that will give the best workout for a particular day. The teacher will need to design the list of exercise for the client that will also include posture, strength, flexibility and balance for the individual. This workshop Tour was designed to provide problem solving and critical thinking. It was very successful. The Tour included equipment for specific variations and challenge such as Spine Corrector, Mat, Magic Circle, and the Stretch Out Strap. These workshops were presented to build a rhythmic workout and cognitive processing. My translator on the Tour was excellent. She was able to translate the content but also used her voice to accent the speach to match what I was saying. When teaching with a translator, the rhythm and flow can become problematic. Communication structure is cultural and based in history. The Japanese language is very interesting to me. I began reading about the language and hired a tutor. When the teacher makes an effort to study, the delivery of the material in English for a Japanese person allows the translator to be more accurate. I find that I begin to talk in English that is not how I would organize sentence structure in the USA. It takes some time to readjust to jetlag and also language lag. My clients in Boulder laugh when I can’t remember the word for Kokansetsu which is the hip joint. While the workshops were great and well attended, it was the work behind the scenes that was amazing. This is hidden from the attendees. Most guest teachers may not notice that the space is ready to go. This does not happen with magic. This group was wrapping equipment to move from one place to the other. They took weeks to look for equipment to rent or borrow. They disrupted their personal studios to make a workshop space. They had lists for attendence, registration, payment, hotels booked, travel arranged, lunch time food, and coffee. They did every courtesy for me and for the people who came. Then we had a party which is when we all say “WE DID IT!”. It is my honor and pleasure to be invited to teach in Japan. Thank you to all who came. And, a special thanks to my Pilates Conservatory Graduates. I will be back in September for Unit 1 which is Wunda and High chair.